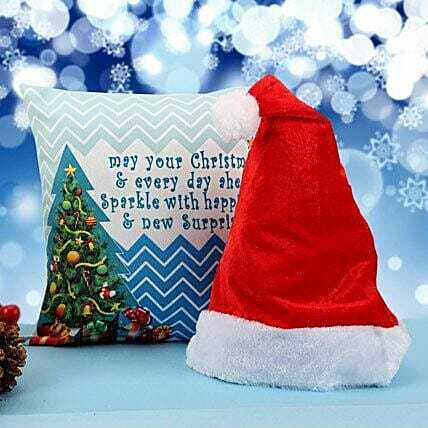 Wish all the luck, good health, prosperity, and happiness persist on the lives of your loved ones this Christmas with this wonderful combo of a cushion and Christmas cap. Send this to your dearest friend or relative and make their Christmas a relaxing one. Since this product is shipped using the services of our courier partners, the date of delivery is an estimate. Your gift may be delivered a day prior or a day after the chosen date of delivery. A courier product is delivered separately from other hand delivered products. No deliveries are made on Sundays and National Holidays. Our courier partners do not call prior to delivering an order, so we recommend that you provide an address at which someone will be present to receive the package. The delivery cannot be redirected to any other address. All courier orders are carefully packed and shipped from our warehouse. Soon after the order has been dispatched, you will receive a tracking number that will help you trace your gift. Always hand wash the cover, using a mild detergent. Never put it in a washing machine. You can also get it dry cleaned. It should be allowed to air dry outside. Wash the cap with mild detergent. Do not machine wash. Allow it for air dry.